Kenya has an eight-four-four system of education. The first eight years are primary, the next four are secondary, and the remaining four are university or other post-secondary institution. Beginning in 2003, primary school has been funded entirely by the Kenyan government and nearly all Kenyan children now attend primary school. There are many primary schools in Kenya, at least one in every village. The schools have become overcrowded since the introduction of free primary education. Subjects taught in primary school include mathematics, English, Swahili, science, geography, and HIV/AIDS. Most students will become eligible to attend secondary school by obtaining a sufficient score on the Kenya Certificate of Primary Education (KCPE) exam. Secondary schools are divided into four categories: national, provincial, district, and private schools. 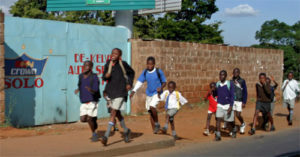 Students can join a higher quality school, such as a national or provincial school, based on their performance on the KCPE exam. The higher quality schools, though providing better education, can be hundreds of miles away from their homes. Students take biology, chemistry, and physics in addition to math, English, Swahili, geography, history, humanities, and art. Most students who obtained primary school education for free and begin secondary school are forced to drop out because they are unable to pay for school fees. 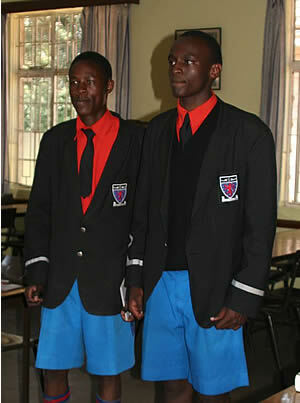 When secondary school is completed, students take the Kenya Certificate of Secondary Education (KCSE) exam. This is the equivalent of the SAT exam. If students obtain a sufficient score on this exam, they are eligible to attend a university or technical school. The typical Kenyan student’s day starts at 6 AM when they eat breakfast and attend study hall before classes. The academic courses are held between 8 AM and 4 PM. Students participate in mandatory sports after classes. Sports include football (soccer), rugby, tennis, volleyball, basketball, and team handball. The William B. Budd Scholarship Fund provides school fees for students starting in the second year of secondary school. It also provides for incidentals, which include school supplies and uniforms. If scholarship students obtain a high score on their KCSE exam, the scholarship fund provides funds for them to attend a post-secondary school.